Qu Dongyu, the Vice Minister of the Chinese Ministry of Agriculture and Rural Affairs, visited the Netherlands. He returned briefly to the country where he completed a key part of his scientific studies in agriculture and horticulture and met with entrepreneurs at World Horti Center. 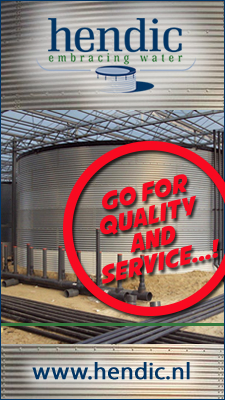 His host was Bouke Arends who was appointed in mid-December as Mayor of the Municipality of Westland. Qu Dongyu was provided with an inside look into the Dutch approach to addressing global horticulture challenges. He also christened a new variety of calla lily. The Chinese government believes Dutch know-how and technology presents major opportunities in the areas of horticulture and agriculture. In turn, the Dutch consider China one of the most important countries for exchanging and exporting knowledge. Vice Minister Qu Dongyu himself is a prime example of this exchange process. In the mid-1990s, he conducted scientific research at the plant breeding department of Wageningen University & Research (WUR). He was the first of an impressive line of Chinese scientists who obtained a PhD with Professor Evert Jacobsen. Back in China, he rapidly climbed the administrative ladder in science and politics. On his current visit, the Vice Minister also called into the Dutch Ministry of Agriculture and met with members of WUR’s executive board too. The Westland greenhouse horticulture cluster collaborates closely with China. Entrepreneurs and both Chinese and Dutch governments are seeking solutions to sustainably grow food and flowers on a large scale. 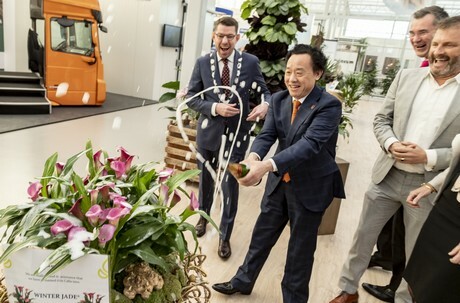 With this in mind, three months ago the recently launched Dutch Greenhouse Delta platform entered into a strategic partnership to develop a high-tech horticulture production centre in Jiangshan, China’s most important economic delta. 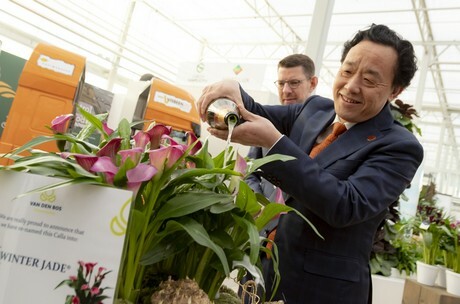 In honour of the visit and long-standing Sino-Dutch relations, Van den Bos Flowerbulbs has named a new variety of calla lily after the minister. Qu officially christened the lily ‘Winter Jade’, which is the meaning of his name, Dongyu. Van den Bos Flowerbulbs exhibits in World Horti Center all year round and is one of the largest Dutch exporters of flower bulbs to countries like China. “Developing new flower bulb varieties takes a long time. We are honoured to name this new variety after a Chinese dignitary,” says Hans Kleiwegt, CEO of Van Den Bos Flowerbulbs.